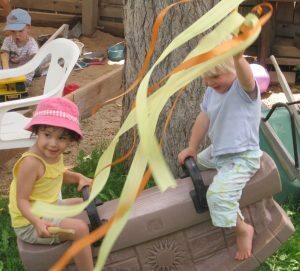 LifeWays practices are based upon the fundamental need for relationship-based care (bonding and continuity), neurological research, and recognition of living arts (domestic, nurturing, creative and social arts) as central to the advancement of children’s social, emotional and intellectual skills. These practices can be applied in parenting, in family childcare homes, and in childcare centers. In child care, “suites” consist of small groups of children who stay together with the same caregivers over a several-year period, creating a more homelike atmosphere and better teacher-child ratios. Emphasis is placed on practical life skills such as building, gardening, cleaning, cooking, washing, repairing, and sewing, among other things. Movement/play curriculum emphasizes child-initiated activities that promote healthy musculoskeletal development, providing opportunities for unstructured, spontaneous movement in a safe environment. Traditional games and finger-plays provide opportunities for the children to imitate healthy movement, develop proprioception and increase both their small and large motor skills. The children go outside in all but the most inclement weather. This helps them become more robust and strengthens their bond with the environment in which they live. A protected area is provided for crawlers and infants. Where it is possible, infants who fall asleep outside can remain outside, snuggly wrapped and covered in a buggy, until time to go in. Fresh air provides a deep, more restful sleep. Emphasis is on loving human interaction with warm speech, live singing, verses, and stories rather than technology. LifeWays Centers and Childcare Homes are television- and video-free environments except for use in administration and adult education. Foundation for lifelong literacy is fostered through storytelling and puppetry, individual lap time with a book, through poetry, verse, and music on a daily basis, through drama, and through the daily interactions of play and movement in a healthy, secure environment..
Pre-School/Kindergarten program is a developmentally appropriate, play-based approach found in Waldorf preschools and kindergartens throughout the world. We provide the best in natural organic foods (whenever this is possible) and involve the children in the food preparation. Festivals and celebrations, honoring the various cultural backgrounds of the families, as well as traditional seasonal festivals and birthday parties, are offered. Foreign language –Community friends who speak a native language other than English may be invited to play simple games or sing simple songs with the children on a routine basis. Infants are provided safe environments in which to explore and move freely – no walkers, bouncers, infant gyms, or other mechanical devices are necessary. The infants are carefully wrapped for sleeping to provide a healthy sense of security and warmth, and caps are provided to protect their sensitive heads and ears. Rocking and cuddling are encouraged to develop a healthy sense of touch and movement and to promote security, bonding and comfort. Physical care (diapering, clothing, feeding) provide focused time for connecting with the caregiver and may include a special name song for the baby or a simple nursery rhyme, and a gentle massage. The baby will be encouraged to participate in clothing herself or himself; for example, by learning to lift its own bottom for diapering or pulling on its own socks when capable. Clear, articulate, melodic speech is expected of the caregivers who are also encouraged to speak frequently to the infants throughout the day.